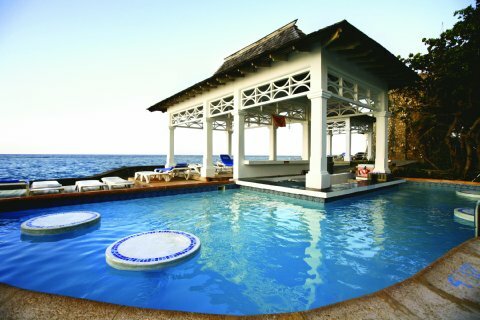 A good friend recently visited Couples Tower Isle in Jamaica and she was gracious enough to share her thoughts with us! At the airport, you'll have to go through immigration. This took forever (an hour or more for us)! Make sure you fill out one form per person. This is different from the US requirements where you fill out one per family. Afterwards, you'll head to the Couples Lounge where you can enjoy Red Stripe, water, or pop. Try a Shandy (Red Stripe and Ting--grapefruit pop), it's delish! Within about a half hour, you'll load into a van and start the nearly 2 hour journey to Tower Isle, with two quick stops at a rest area (you might need to use the rest room after a few Shandys) and Couples Sans Souci (to drop off some other guests). You'll tip the guy that loads the bags in the van and the driver because these people are not Couples employees. You'll check in and a bellhop will take you to your room. You'll quickly notice that basically the only place that has air conditioning is your room. That was my ONLY criticism of the trip, since I really like air conditioning. The room was simple, but very comfortable. If you sign up for Couples Rewards ahead of time, you can preselect the beverages in the mini bar, so you're set to enjoy another beverage. Sign up for excursions and dinners as soon as possible. You'll need to make reservations to eat at 8 Rivers and Bayside, but you can eat at those multiple times during the week. Friday night is lobster night (in season) in most restaurants, so my suggestion would be to go to 8 Rivers twice---once on Friday and once another time. The Dunns Rivers Falls Excursion is a must. It's mandatory to wear water shoes, so people who visit should try to bring them. Otherwise, they'll have to purchase shoes ($17) or rent them ($7). You'll be totally submerged during the hike, so wearing only a bathing suit (and maybe a pair of shorts for the ladies, shirt for the guys at most) is perfect. Most people just wear swim suits. You'll have to tip the guide (we gave $10) and there is a market that you have to walk through on the way out. Bring some cash if you want to shop. The tricky part is keeping it dry. You can leave it in the van if you want. Your guide will follow you out there anyways. Some people also bring waterproof cameras, but since you'll have to hold hands, you'll need to keep it in a pocket or around your neck. Bring a towel to dry off afterwards, but other than that, you won't need anything! It's about a 2-2 1/2 hour long excursion, including transportation. The nearby Couples Sans Souci is a great resort. On Monday, Wednesday, or Friday you can visit that one. A van will drive you and you'll be there from 9:45-4pm. For us, this was another "must-do". The pool bar there had a super fun atmosphere and the restaurant with the lunch buffet (Palazzina) was great! The Catamaran excursion was also very enjoyable. You'll just wear a swim suit and cover up. Bring a towel. After a ride around the waters, you'll stop for a 20 minute swim in this gorgeous cove and then head back. They serve rum punch or fruit punch during the ride. We also went on the glass bottom boat tour. This is the same boat that will be used for snorkeling, so you don't necessarily have to do both. It was fine, but we wished we would have snorkeled instead. You can be as active or sedative as you want. We were only there 5 days, so we took the relaxing route. There are many more fun activities to enjoy that we just didn't get around to. In regards to what to bring, pack very lightly. A few nice outfits to wear at night, a few swim suits and beach wear, and LOTS of sunscreen (like 4 bottles) is basically all you need. They provide shampoo, body wash, and lotion. The ladies might want to bring conditioner with them. The resort also provides beach towels, so no need to bring your own. At the end of the week, turn in the beach towels for a receipt so you don't get charged for them. The week will go by way too quickly, and it'll be a great time. There are many discussion boards on the Couples website and most of your questions can be answered there.